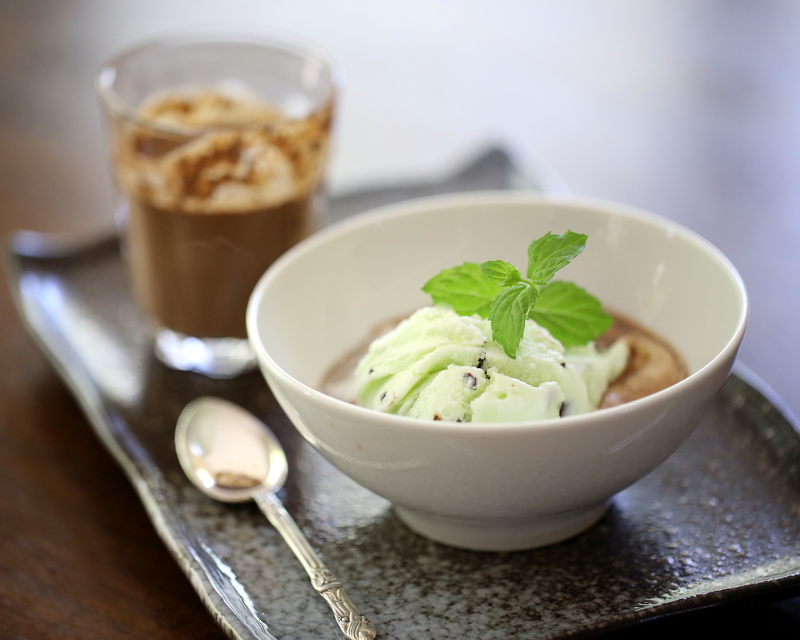 The Negresco, a scoop of choc-mint gelato served with a hot chocolate, is a refreshing reworking of the classic affogato. I came across this dessert idea in New Caledonia where I saw it listed on several menus. While it sounded fabulous there were so many treats to try in only a few days that I didn’t get around to it! Surprisingly, I haven’t been able to find any recipe or photo on the internet which comes close to what I read and imagined. My recreation is based solely on what I read so I can’t in any way vouch for it’s authenticity but when something tastes this great it hardly matters! 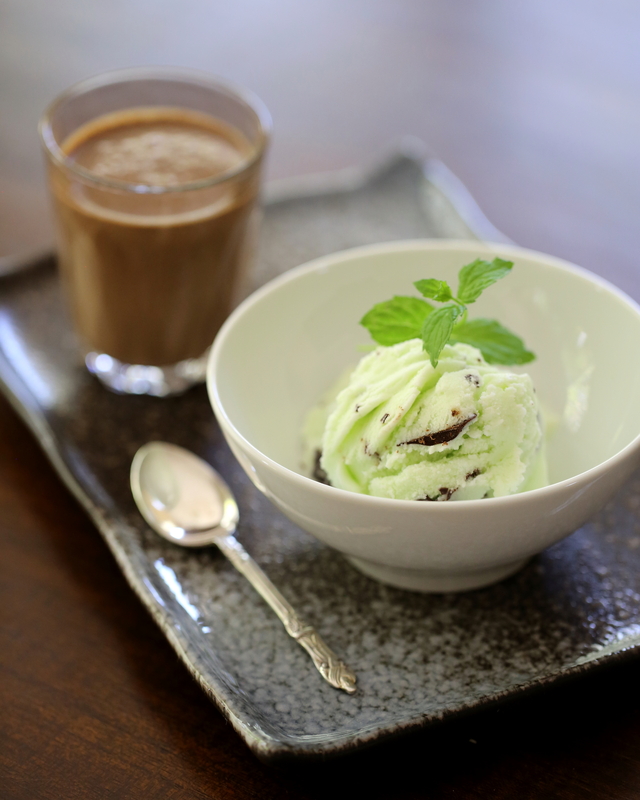 The ice cream recipe below has been based on Irvin Lin/Eat the Love’s recipe for fresh mint chocolate chip ice cream. Irvin’s recipe uses fresh mint and honey and while it sounds amazing I didn’t have any fresh mint available. 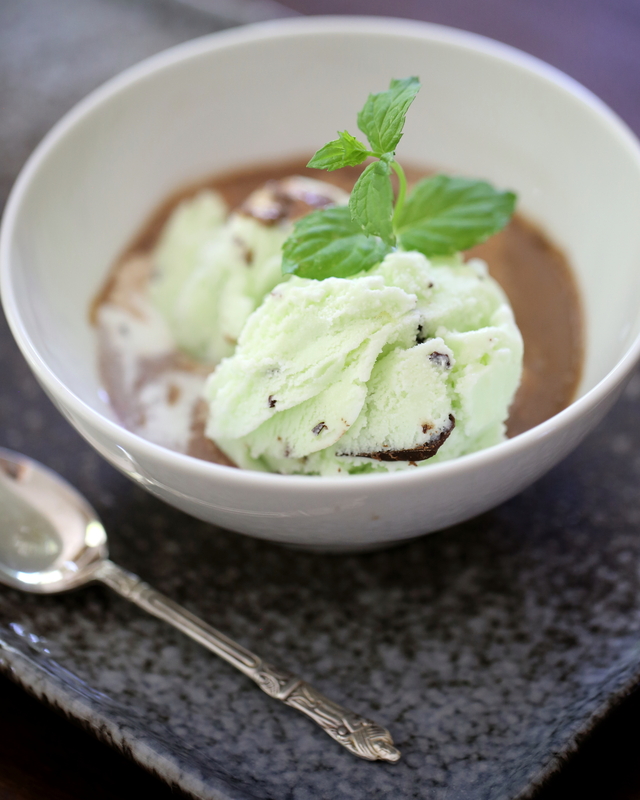 Did you notice the little sprig of mint used to garnish the ice cream in my photo? That’s pretty much all the mint I have managed to grow! Even though a small and sad bunch of mint costs almost $3 at the supermarket they had run out when I went to buy it so I used a combination of Crème de Menthe and peppermint essence for flavour instead. To make the ice cream, mix together the arrowroot with a few tablespoons of the milk and set aside. Place the remaining milk, cream, sugar and glucose syrup in a saucepan and, stirring occasionally, heat until boiling. Add the dissolved arrowroot and stir. Remove from the heat when the mix has thickened. Add the creme de menthe and peppermint essence; stir. Chill the mix in the fridge until cold. I made the chocolate chips while the milk/cream mix was heating. Melt the chocolate, add the oil and stir. Spread the chocolate in a thin layer over a piece of non-stick baking paper. When set, wrap up the chocolate in the paper and place in the freezer until needed. Churn the ice cream mix in an ice cream maker. When the ice cream has churned, remove the chocolate from the freezer, crumble and add to the ice cream; stir through. Freeze until firm. Heat the milk then add the chocolate and stir until the chocolate has dissolved; add sugar if needed. Serve immediately in a glass or cup alongside a bowl of choc-mint gelato. Posted in Gelato, Ice-Cream & SorbetTagged affogato, chocolate, creme de menthe, desserts, Eat the Love, gelato, hot chocolate, mint, new caledonia, nouvelle caledonieBookmark the permalink. Your version looks fabulous! I hope it tasted as good as it looks…. Thanks Irvin! It was great thanks to your fabulous ice cream recipe!! Beautiful photos Stephanie! Looks so delicious. This is quite different from the negrescos served in New Caledonia. The ‘hot chocolate’ is really just a hot fudge sauce, served in the bowl with the ice cream. Once the hot sauce was at the bottom of the bowl, another time kind of dribbling down the sides. It’s usually served with sliced almonds, and at one place I had it was served with whipped cream on top. I love what you’ve done with this version! Thank you! That is good to know! It sounds delicious! !